On 4 November 2016, the autumn session of the Orthodox Bishops’ Conference of Germany opened in Berlin. Taking part in it were ruling and vicar hierarchs of the Orthodox dioceses in Germany. The Russian Orthodox Church was represented by Archbishop Feofan of Berlin and Germany, Archbishop Mark of Berlin, Germany and Great Britain, and Bishop Agapit of Stuttgart. 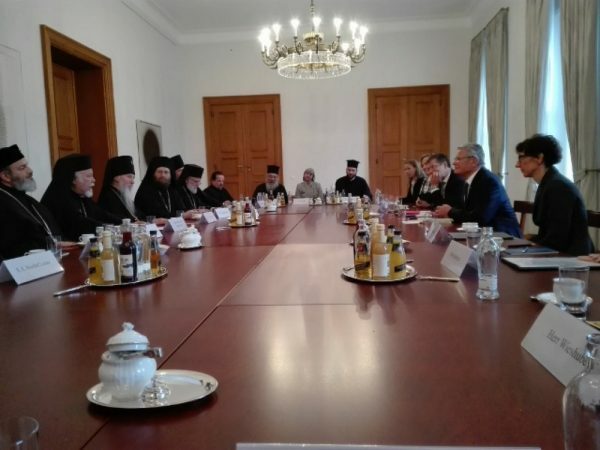 In the morning, the Orthodox hierarchs met with the President of Germany, Mr. Joachim Gauck. The participants in the meeting discussed the situation of Orthodoxy in Germany, the problems of migration and spiritual guidance for the Christian refugees, as well as the inter-Christian dialogue and the Council of the Primates and hierarchs of the ten Local Orthodox Churches that had taken place in Crete. Later that day, at the Church of the Holy Archangels Michael and Gabriel, the hierarchs met with the Orthodox clergy of Berlin. Archpriest Mihail Rahr, rector of the German-speaking community of St Isidore of Rostov, told about the activities of the Russian Orthodox parishes in Berlin. The participants in the meeting discussed the challenges of integration, as well as the problems of preservation of national languages for liturgical purposes and for facilitating the communication of the faithful outside the church. Bishop John of Palmyra told about the activities of the Patriarchate of Antioch, aimed at rendering assistance to the Christian migrants in Germany. In the evening the participants in the Orthodox Bishops’ Conference prayed at the divine service in the Church of the Holy Archangels Michael and Gabriel. Among those present in the church was His Excellency Heiner Koch, Roman Catholic Archbishop of Berlin, who greeted the worshippers after the service, emphasizing the necessity to preserve Christian unity in the face of the challenges posed by the secular world. On November 5, the working session continued at the Church of the Holy Tsar Boris (Bulgarian Patriarchate). Discussed at the metting were the outcomes of the Crete Council and the current activities of the Orthodox dioceses and parishes in Germany. The autumn session of the Orthodox Bishops’ Conference of Germany was concluded on November 6. That day Metropolitan Augustin of Germany and Exarch of Central Europe (Patriarchate of Constantinople) officiated at the Divine Liturgy in the Church of the Holy Prince Vladimir, Equal-to-the-Apostles, in Berlin. Concelebrating with him was an assembly of archpastors and pastors from various Orthodox dioceses. The liturgy was celebrated in the Church Slavonic, Greek, Georgian, Arabic, and German languages. The next session of the Orthodox Episcopal Conference of Germany will take place in Munich on March 3-5, 2017.